Able to seat seven passengers, the 2017 Mercedes-Benz GLS SUV offers rugged performance and in-cabin luxury at a cost-effective rate. Drivers can choose between four trims equipped with potent engines, intuitive handling technology, and contemporary infotainment systems. RBM of Alpharetta, located north of John’s Creek, is your local source for the newest Mercedes-Benz SUVs! The GLS SUV family sports four unique engines, ranging from 255 to 577 hp. With Trailer Stability Assist and the optional trailer hitch, Alpharetta and John’s Creek drivers can tow as much as 7,500 pounds. 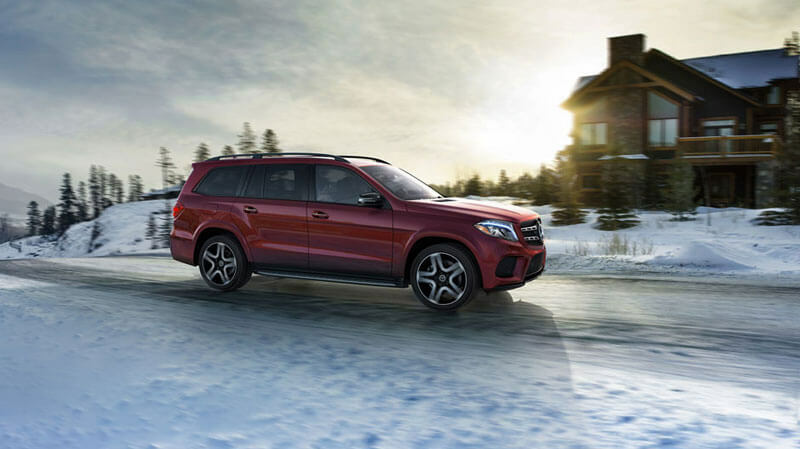 The GLS 550 and below get a 9G-TRONIC® automatic transmission with shift paddles, while the top-tier AMG® GLS 63 gets an AMG® SPEEDSHIFT® PLUS 7G-TRONIC. Well-balanced and designed for comfort, the AIRMATIC® suspension system can adjust the GLS SUV’s ride height with the push of button for greater aerodynamic or higher ground clearance. Meanwhile, DYNAMIC SELECT® lets you choose between four driving modes via the console-mounted controller. The 7-person interior of the 2017 Mercedes-Benz GLS is protected by a host of standard and optional safety systems – some of which are new for MY17. Replacing COLLISION PREVENTION ASSIST PLUS® is Active Brake Assist, which provides maximum stopping power to help you avoid a collision. Also new for MY17 is optional Distance Pilot DISTRONIC® – a radar-based cruise control system that stops and accelerates your vehicle semi-autonomously. The standard rearview camera lets you reverse and parallel park in confidence, while optional MAGIC VISION CONTROL® uses heated blades to keep the windshield crystal-clear. Housing three rows of seating, the GLS sets the bar for both space and luxuriousness. Standard Eucalyptus wood trim accents the dash and four doors, while optional Exclusive Nappa leather upholstery ties in high-contrast double top-stitching for a truly opulent interior. The higher-tier trims tack on multi-contoured, heated, and ventilated front seats, as well as a panorama roof for fresh air and a view. The new Remote Start feature for the mbrace® app lets you power on the engine and multi-zone climate control system from your smartphone. Meanwhile, the power liftgate can be opened and closed via a switch on the driver-side door panel, proving easy access to the GLS SUV’s 94-cubic-foot cargo area. 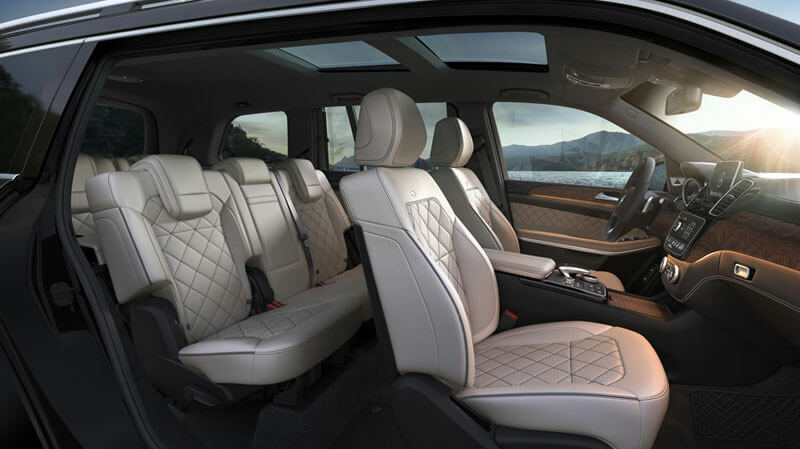 Smart and ultra-modern, the cabin of the Mercedes-Benz GLS offers everything you need for a comfortable journey. The 8-inch COMAND® freestanding screen comes with a touchpad controller, which responds to finger motions as easily as a smartphone or tablet. In-cabin functions, such as Bluetooth®*, audio system, and optional navigation, can be controlled via the Nappa leather-wrapped steering wheel or optional voice control system. Available for each GLS trim, a harman/kardon® Logic 7®** sound system dishes out 830 watts of sound via 13 speakers. Outfitted with a 3.0L V6 turbo-diesel engine, the GLS 350d SUV (coming soon) has an output of 255 hp and 455 lb-ft of torque, as well as a 7,500-pound towing capacity. For a base price of $67,050, the GLS 350d SUV includes redesigned headlamps, LED taillamps, and dual chrome exhaust trips for a fresh look and feel. Furnished with a 362-hp biturbo V6 engine rated at 369 lb-ft of torque, the GLS 450 SUV earns 17 mpg in the city and 22 mpg on the highway. Aluminum roof rails and 19-inch wheels give the GLS a sturdy appearance, while the interior brags ATTENTION ASSIST® and an 8-inch COMAND® screen with a touchpad – all for a starting MSRP of $68,700. Available for a base rate of $93,850, the GLS 550 SUV generates 449 hp and 516 lb-ft of torque, thanks to its biturbo V8 engine. The GLS 550 SUV’s ECO Start®/Stop system helps it land a 14 city/18 mpg highway rating, while DYNAMIC SELECT®, AIRMATIC® suspension, and Adaptive Damping System master any terrain. The range-topping AMG® GLS 63 SUV – priced at a starting MSRP of $124,100 – gets a 577-hp AMG® biturbo V8 engine – signed by the AMG® technician who hand-crafted it. The AMG® Sport Suspension and 4MATIC® all-wheel drivetrain carve corners with ease, while ECO Start®/Stop works to secure an impressive 13 city/17 mpg highway rating. The three-row 2017 Mercedes-Benz GLS makes comfort a priority without sacrificing performance, fuel economy, or handling. Contact RBM of Alpharetta at to book a test drive, or pay us a visit at 345 McFarland Parkway in Alpharetta, GA! We look forward to helping you choose the right GLS SUV for your family!